American doctor Sam Axelrad was serving in Vietnam in 1966. When an enemy soldier was shot in the hand by U.S. troops and brought to the hospital, he dutifully operated on him. Axelrad had to amputate the arm, and afterward kept the bones. He brought the grizzly souvenir home as a reminder that when a wounded North Vietnamese soldier was brought to him, he did the right thing and treated him. The partial skeleton stayed hidden in the closet for decades until 2 years ago. That's when Axelrod, curious about the patient's identity, decided to track him down. He succeeded. 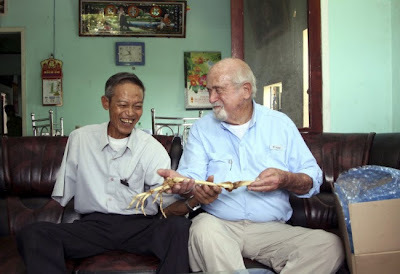 Axelrad met Nguyen Quang Hung in Vietnam and returned the arm, with which Hung now plans to eventually be buried. A surprised Hung says, "I’m very glad to see him again and have that part of my body back after nearly half a century. I’m proud to have shed my blood for my country’s reunification, and I consider myself very lucky compared with many of my comrades who were killed or remain unaccounted for. I can’t believe that an American doctor took my infected arm, got rid of the flesh, dried it, took it home and kept it for more than 40 years. I don’t think it’s the kind of keepsake that most people would want to own." It really isn't "the kind of keepsake that most people would want to own" but I'm glad doctor Axelrad kept it, and that he tracked Nguyen Quang Hung and returned it. This story is bizarre but it's what made it very interesting.